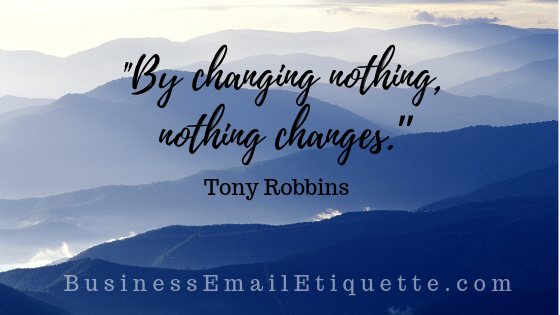 Starting today, I am cleaning my email list. It is literally well over a decade old and will be retired in the weeks ahead. So I’m starting a new fresh list which will allow me to be able to communicate with and cater to those folks who are currently interested in what I write about here on BusinessEmailEtiquette.com. So here is what you need to know if you want to continue getting updates! Either use the form below or the box in the right sidebar and resubscribe. Your email address will only be used to send you a quick update when I add a new post. Your email address will NOT be shared with any outside/third parties. If you were notified of this post via email, it is because you are on the old list. That list will will be deactivated after next week. So if you don’t want to miss all the new stuff I’ve got in the pipeline, stop now and resubscribe. I will be sending from a new e-mail address too: news [at] businessemailetiquette.com. So be sure to whitelist, add it to your address book or approved senders lists to make sure my emails will get through to you. And for those who are great contributors and really add value to my site, I’ll be randomly choosing folks to award freebies to. Not just because you comment, but because you add value to this site! So what are you waiting for? Resubscribe now!